Several weeks ago, The New York Time ran an excellent graphic showing the interconnectedness of European debt in Europe’s Web of Debt. Other sources periodically trot out various charts of credit default swaps (CDS), but I have yet to see a graphic which attempts to measure the risk of global contagion. This week’s chart of the week is an attempt to reduce a hypothesis about global contagion to a simple ratio chart. The hypothesis is that whereas the VIX is the best measure of uncertainty in the U.S. stock market and the VSTOXX (which is based on the EURO STOXX 50) is the best measure of uncertainty for euro zone stocks, the ratio of the VSTOXX to the VIX should capture the relative uncertainty for euro zone stocks vs. U.S. stocks. One would expect, therefore, that if VSTOXX is rising faster than the VIX, that options traders are expecting much higher uncertainty (and downside risk) in the euro zone than in the United States. This type of action would support a decoupling theory in which stock markets in the euro zone and the U.S. would begin to move independently of each other. 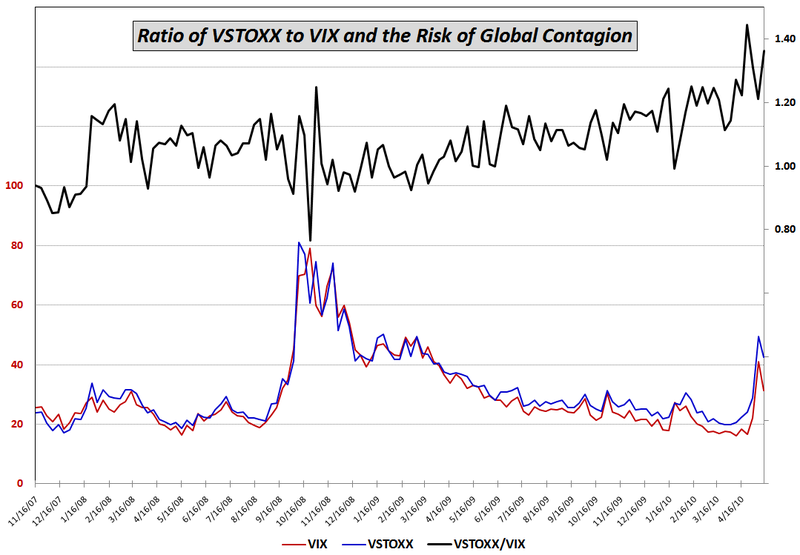 On the other hand, should the VIX be rising at the same rate as VSTOXX, this would suggest that uncertainty and risk are roughly the same in the euro zone and the U.S. and that the risk of global contagion is relatively high. The chart below is a weekly chart of VSTOXX and the VIX going back to November 2007, just after stocks peaked. Looking at the ratio during the past 2 ½ years, it shows that VSTOXX peaked relative to the VIX three weeks ago, pulled back dramatically up to last week, then surged up through Friday, where the ratio had its second highest weekly close. The verdict from the ratio seems to be that the risk of global contagion is high, slightly below the all-time high, but on the rise. 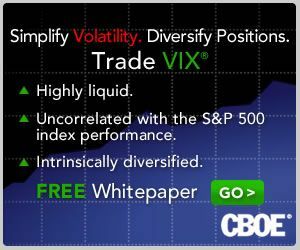 I will have more about the VSTOXX:VIX ratio going forward.